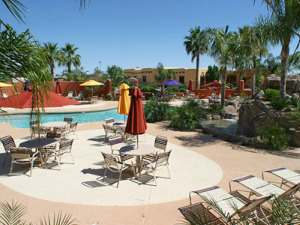 The Arizona Park model living lifestyle, maybe something totally different from what you think. Those that are enjoying these lifestyles, may wish that I would not tell you about this fun way of living. Sorry, this is just too good...to keep a secret... it is time to let everyone know about this lifestyle that does not cost an arm and a leg...read on to see just how cheap. It is no small exaggeration to say that the activities in these communities is akin to those activities found on a cruise ship...and who doesn't like to go on a cruise ship? There is something perverse, about these folks...they have just heard from their friends who are shoveling out of the latest snow storm to hit the Midwest. Arizona Park model living communities, depending on the size can have several pools... Maybe one will allow you to bring the grandkids between 2 and 3 PM...another may be set up water volleyball, a daily afternoon ritual at some parks. Most will also have hot tubs so you can soak after a hard morning of golf, pickle ball, or hiking. We have good friends from Oregon, who purchased a Park model mobile home in Mesa two years ago, for $15,000 furnished. They now look at their Oregon home as a place to rest from all the Arizona activities that they enjoy, while they are here. 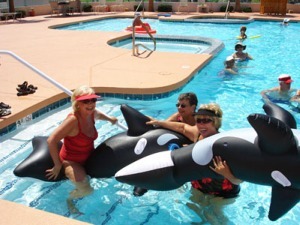 They are so busy being retired, we have to plan weeks in advance would get together...Arizona Park model living is not for the faint of heart. As this is written, they are on the road to Mesa... It was 4 degrees...that's Fahrenheit... When they left... It is 90 here in Arizona. As I have stated on previous pages, it is possible, all day long, to buy completely furnished units starting around $10,000. You also are responsible for a monthly "lifestyle" fee, that is collected year round, of between $300 and $800 a month...this includes all the common area maintenance. The upkeep of the pools, lighting, property taxes, payroll of the staff, etc...your responsibility is your utilities,your phone,personal property insurance, etc. For all this fun,it seems like a bargain to me...my Oregon buddies, that are enjoying this lifestyle as we speak, are giddy about how much bang for the buck they are getting. There other home is in Oregon in a gorgeous custom home. I rest my case... this lifestyle, is one of the true retirement bargains available to anyone...anyone that is that enjoys seeing the sunshine over 300 days a year. There is room for you too. What are you waiting for?